We were out of our minds to want to visit Las Vegas. A city with such a reputation as Sin City did not really mesh with our purpose or previous encounters across the United States. We are mellower in our mission. We are out to make the world a better place. A place like Las Vegas had no place in our itinerary, right? So as sure as the casinos will always come out ahead, there is always the chance that we could and would find people to serve as we visit Las Vegas. We chose to visit Las Vegas because we were looking for a place we would not be restless to explore. Lindsay visited the city previously and I had no real interest in anything but rest, repairs to our truck and camper and focusing on some decisions we had to make concerning our upcoming itinerary. The Grand Canyon had blown us away the previous three days. It was truly beyond expectations. And after traveling over a thousand miles in the course of a week to escape cold weather in the Midwest, a week in the desert was welcoming. Our eagerness peaked the longer we chased the desert sun across the afternoon sky. Sure, it was a city for which we felt no attachment. But it was new in our journey, and we weren’t really supposed to be there. So that was enough to build a sense of excitement. We reached the city around 9 PM on a Saturday night. The city was alive. Neon billboards cast light into the night sky, flashing and popping as they changed from one scene to the next. They were like runway lights leading us down the Strip into the heart of Las Vegas. The sidewalks were crowded, packed with people that appeared to move as one mass along the side of the Strip. This massive clump of people moved faster than we did. We sat in traffic for nearly an hour as we tried to clear the core of the three-mile stretch of the Strip. Eventually we found our way to our RV Park, our home for the next week, and settled in for the night. Joe and Judy are our lifelong friends now. We might as well call them family. The next morning we woke up to the dry heat of the desert. When you visit Las Vegas you find out why the city is not really supposed to exist as a major metropolitan area. It’s supposed to be a watering hole between two points on either side of the desert. It was ironic then, I suppose, that we were looking for purpose in a place that was not supposed to exist. I grabbed my morning coffee and took Everest to the dog run. Being a city that receives less than 4 inches of rain annually, Las Vegas is stingy about the amount of grass it parcels out. As such, the dog run was a simple patch of gravel that was the central place for all pet owners in the park. Every dog used the restroom there and you could tell. We didn’t stay long. Everest was equally unimpressed. Upon arriving back to our camper I noticed that a new Class A Motorhome had backed in behind us. 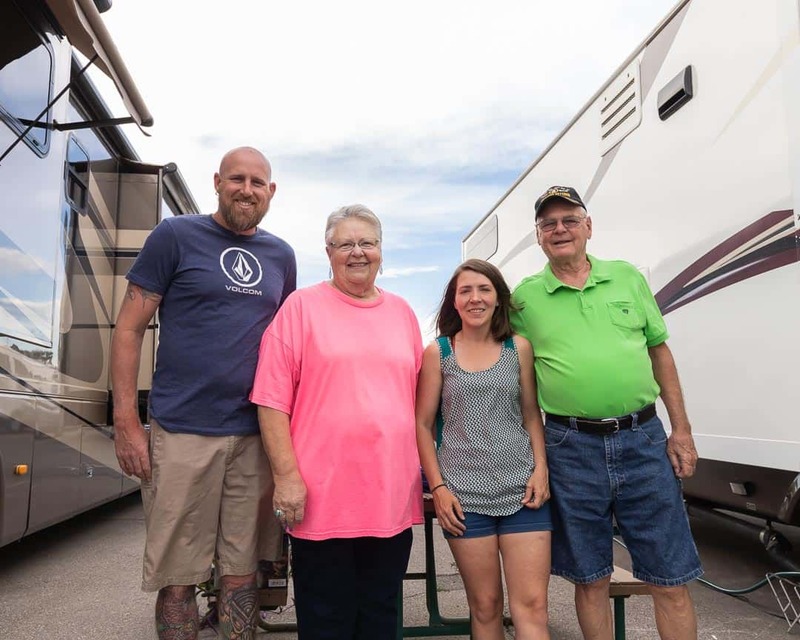 Because lots of people like to visit Las Vegas in their RVs, we were staying in a large RV Park just a few miles from the city center. The park could hold several hundred RVs and was full, mostly with large Class A Motorhomes. The driver, Joe, hopped out to check his parking and I introduced Everest and myself. I’m terrible at guessing age and still don’t know how old he is. But Joe and his wife, Judy, were somewhere between the age of my parents and what my grandparents would be. You couldn’t tell it though. Joe was so full of energy for so early in the morning! After double-checking the parking job Joe circled back around to inspect the rest of his rig. While he was doing so I noticed that there was moisture on the ground at the back of his rig near where the engine was located. Because almost everything in our truck and camper had already broken so early in our trip I was hesitant to point it out to him. “Hey Joe, I’m not sure if this is normal or not,” I said pointing to the drip. He sort of scratched his head as he examined it. I learned a lot about the mechanics of engines while getting our truck ready for the road. One thing I learned is that different fluids have different colors, consistencies and smells. So I kneeled beneath the engine compartment and dabbed a rag in the fluid. It was sweet, and slightly pink and had the distinct smell of engine coolant. I shared the news of what I suspected to be a leak in the engine cooling system and put my hands on my hips. Fearful that I was not mechanically inclined enough to fix the issue, I still felt words swell up in my throat. I knew the right thing to do, even though I had only just met Joe and I had a long list of repairs I needed to make to the truck and camper. I could tell that Joe was just as reluctant to accept my offer as I was to make it. But I could sense it was not out of pride. I could tell Joe wasn’t a mechanic in a previous life either. It wasn’t that he wanted to fix the issue himself. It was that Joe didn’t want a stranger, turned friend, to have to trouble himself to fix an issue that he didn’t cause. Joe was like all of us in that moment. He was helpless, with an offer of help on the table. He had to accept the offer. But sometimes accepting help is harder than offering it. In fact I’d say accepting is almost always harder than offering. “Oh, if you’d like” he finally responded. We were both relieved, I think. Joe would get his help and I would find my purpose for the day. Though, admittedly, neither of us was looking for this exchange when the day began. I spent the better part of the next two days, split in various sections, beneath the engine. It was a simple diagnosis that we complicated to resolve. Joe’s rig was, like ours, used. The radiator hose had become dry rotted at a point where the heat and pressure of the fluid had forced a leak between the rubber. Whereas you should be able to squeeze the hose and feel it flex sturdy like a racquetball this hose just cracked more. We tried wrapping the leak with Flex Seal tape, a product with the self-proclaimed ability to stop any leak. However the tape slid right off the hose. Mechanic Hack: The cute glasses actually kept engine coolant from leaking into my eyes. So we tried clamping the tape to the hose on either side of the leak. This just slowed the leak momentarily and allowed it to pool beneath the tape until it found a new way out. Our last option should have been our first choice. That is, we decided to replace the entire hose. Unfortunately, as I was learning with all repairs on the road, making the right repair often takes more time, energy and money. But doing the job right the first time, especially when it came to helping Joe and Judy make their thousand-mile journey safely home to Oregon at the week’s end, was the right decision. We drained what seemed to be five or six gallons of engine coolant from the system so we could remove the hose. Then I removed the hose in the course of an hour or so. It should have taken less time. But the hose was so rotted into place that I couldn’t simply pull it up and over the t-joint where it connected to the rest of the system. I had to pull and twist and cut it a little bit at a time until it finally popped off. In the process I ended up covered in engine coolant and old oil. I wore these stains proudly on my “wife beater” as war wounds. Several trips back and forth between an auto part store for a new hose, clamps and engine coolant and we had the leak fixed. The rig was road-ready for Joe and Judy’s return to Oregon and I felt accomplished – both as an amateur mechanic and as a human being. Joe and Judy were so pleased with the help we offered that they spent the rest of the week “adopting” us into their family. They took us to breakfast and broke us into the casino buffet scene… twice! We spent afternoons talking and they even shuttled us down to the Strip one evening so that we could save a few dollars on a ride share. Joe and Judy volunteered to bring Everest into their rig and watch her for the evening while we ran around the city taking photographs of the highlights. After all, you cannot visit Las Vegas without going to the Strip at least once! When we returned and I knocked on the door to thank Joe he greeted me with a bag of brand new “wife beater” t-shirts. “Here. 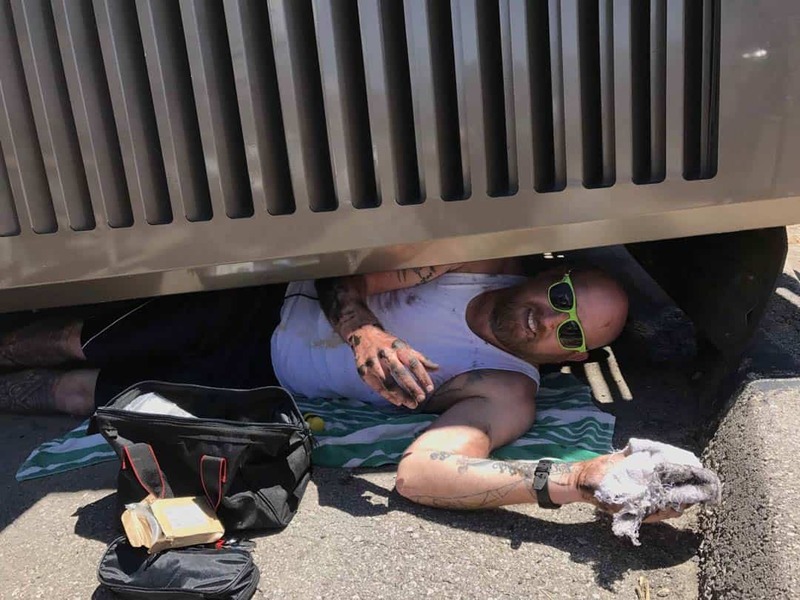 Now you can fix a few more rigs when you get the chance,” he said with a smile. We balled our eyes out in laughter. Friendship was enough for us. The shirts were over the top. We came to visit Las Vegas for reasons we had yet to satisfy. But the one thing we should have longed to find, friendship, was readily accessible. I never thought I’d spend two days to visit Las Vegas. We spent eight by the time we tacked two more days to our stay so we could spend more time with Joe and Judy. They became fast friends and when it was time to leave we were truly sad to have to part ways. They were headed northwest toward Portland and we had decided to head northeast into Utah. There was a chance our paths would cross again. With life, there’s always the chance of paths crossing again – whether intentional or not. When we arrived in Las Vegas we were thinking about ourselves. We had a list of things we wanted to knock out to serve our own needs. And these were legitimate needs. We weren’t planning a trip to Vegas to spend thousands of dollars in casinos. But we had put others second to our own needs. When we arrived in Las Vegas we were tired of trying to find people to help. We figured the world was full of people who needed help. But we were telling people that we were looking for specific people we wanted to help – kids with severe illness and foster families. In Las Vegas we realized that helping people is far easier than we made it out to be. We accepted that we were on this journey to help anyone and everyone who was in need. Sure, we could not solve all of the world’s problems. In fact, to feed the homeless in just the streets of Las Vegas would have bankrupted us. But our call to serve was simple. It wasn’t to sick children or foster families. Nor was it to homeless people in the streets. Our call was to a stranger, turned friend, who had a need that stretched just beyond what we felt we were capable of achieving. I think that’s the beauty in truly helping people. First, it’s throwing away what we perceive to be the need we want to solve. And second it’s finding a need to solve that stretches us beyond our comfort zone. Sure it’s great for doctors and nurses to help heal people because that is their expertise. And it’s nice for culinary experts to prepare meals for lines of homeless people. But sometimes it’s more important to be an expert at being a human being. It’s recognizing a need in another human being and having the empathy to put yourself in his or her shoes. In those moments you come to realize that you are the only choice that either of you have in that situation. Then you either help, or you don’t. 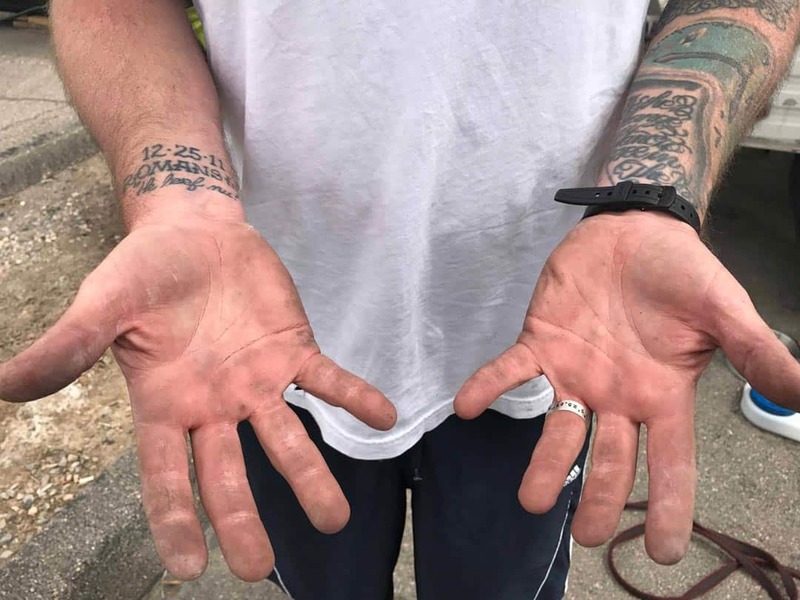 Sometimes your hands get dirty when you help people. I prefer my hands this way. We left Las Vegas with a renewed sense of vision and purpose for our journey. In helping Joe and Judy we released a self-imposed burden we placed on ourselves when we selected the people we thought we wanted to help. Our mission was always more broad than we let ourselves believe. We were always “traveling with purpose.” That purpose was simply to help anybody at any time that showed need of help – even when we visit Las Vegas. And with this renewed sense of purpose, restored health and a few items on our checklist accomplished we carried forward in our journey with new optimism for the road ahead. We were grateful that we took the time to visit Las Vegas.